If you should happen to meander your way around the tranquil and picturesque lake between July and October, well, you may just catch a glimpse of blue-green streaking across your line of sight. What you may have seen is one of our most acrobatic masters of the air as it darts about hunting it’s prey which ranges from tadpoles, small fish and other small flying insects. 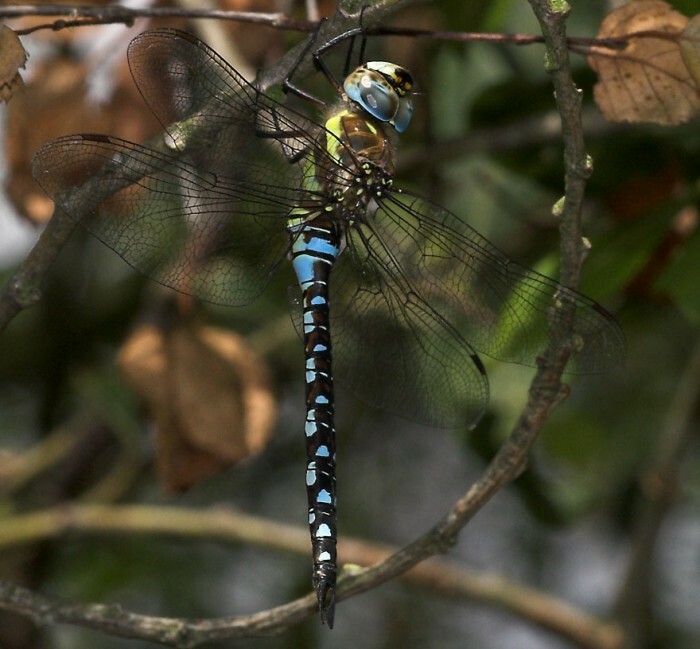 It is (Aeshna cyanea) the Hawker dragonfly. They take between one and three years to develop from nymph to dragonfly and emerge as fully formed adults in early July or August. Aeshna cyanea – Hawker dragonfly at rest. Although the life cycle of the nymph is measured in years the adults live perhaps just 2 or 3 months. The compound eyes of dragonflies give them 360 degree vision and their wings enable them to hover and fly backwards. Fossil records from around the world tell us that dragonflies existed as far back as the Permian-Triassic period some 250 million years ago. At this time they were considerably larger than today due in part to the higher oxygen content of the atmosphere at that stage of the earth’s history. ← Did you know – Dandelions forecast the weather?